Ah, sitcoms. I watch several, and they're definitely not shows I find from my mom. In fact, I don't know if she watches ANY sitcoms regularly. Do you? I do think I found this one via Lifetime reruns a few years back, and now I watch it regularly, despite it not being very good. Rarely do I start watching a show from its pilot -- maybe I want to wait and make sure it's going to stick around/be popular enough to bother watching? There are exceptions to that rule though (Fringe, Up All Night and some of the other NBC sitcoms). Anyway, with this show I laugh and really like the Barney character BUT it's "just tell us who the mother is already" that makes me keep watching and wishing that I didn't watch. Pretty dumb. I do like the version of New York in which they live, although the street scenes are so fake lot-style that it's laughable. With fast forward I can watch a DVR'ed episode in 20 minutes or less. Seems like TV shows are getting shorter and shorter. Annoying. Maybe they're saving the extra scenes for the DVDs. 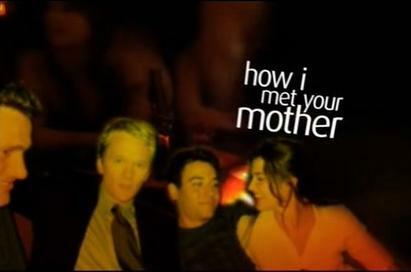 I do watch "How I Met Your Mother" reruns when nothing else is on. Some of them are very funny and I like that the one guy is from Freaks & Geeks. But it's no Big Bang Theory.